The first personal computer was the IBM 610 Auto-Point Computer and was officially announced in 1957. 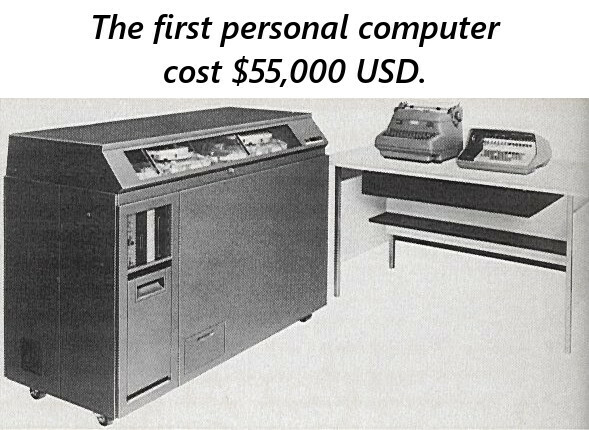 The cost to buy one of these very large computers was an outstanding $55,000 USD which when adjusted for inflation would cost over $460,000 USD today! This is so expensive even without accounting for inflation. It's amazing how in modern times the cost of a cell phone is a fraction of the IBM 610 and is also thousands of times more powerful than the 610. But this also makes us wonder just how fast and powerful computers will be in another 50 years time. Perhaps, people will look back and wonder just how we managed to live with such weak and expensive computers, if they even still use computers by then.